Hey look! Fear not! The incredible Kaiju workshops have dates in January and February, 2014! Register now, these are limited edition, special guest instructor led workshops. To register roll over our Workshops & Course link for the sub-menu. Kaiju [working with liquid plastic] workshop! Sculpt, mould and create your own plastic figurines, wearable art, and more! – design concepts, and bringing ideas to life! – tips on how to set up your own little casting factory in your basement, garage or over at Mom’s house. Registrants receive kits that include silicone mould material, polyurethane plastic, clay, armature materials (if your piece(s) call for this), mixing containers, tints and dyes. Nitrile gloves will be available for use, and half face particulate masks, however, students are encouraged to bring in their own respirators if they own one. The $105 materials & lab fee is your deposit towards this workshop. The remaining fee is due the first Intro evening. Please leave a note with your registration for which workshop you’re signing up for, Jan or Feb, Thanks! 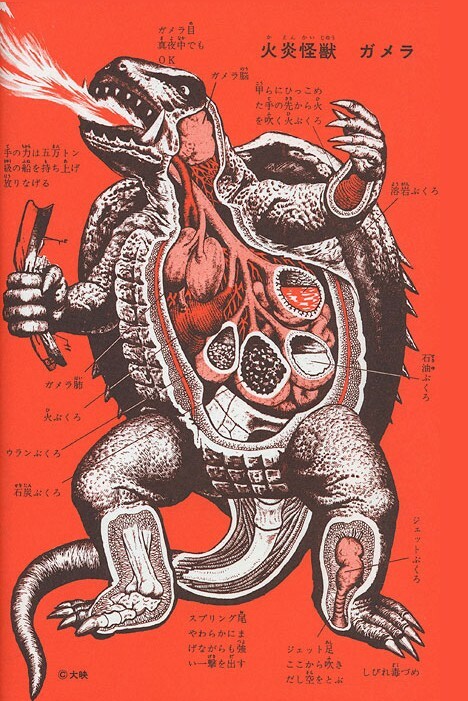 This illustration of “Flaming Monster Gamera” (from An Anatomical Guide to Monsters) reveals eyes that can see in the dark, arms strong enough to lift and throw a 50-ton boat, and “fire sacks” that let Gamera shoot flames from his hands. Previous PostJewelry, metalsmithing, glass, mould making and plastic classes in TorontoNext PostMetal + Glass workshops and course update!